Windows Vista has included built-in MPEG-2 decoder or codec from Microsoft into the system. Thus, unlike in Windows XP or earlier, users can watch DVD and view live telecast or recorded TV shows without the need to buy or download and install third party DVD MPEG-2 decoder such as PowerDVD and WinDVD, or free MPEG2 codec or DirectShow filter. However, although not necessary, any user may have multiple MPEG2 decoder installed on the Windows Vista system, as the result of installing application with DVD format encoder/decoder. All codec is not created equal. Microsoft’s codec has been famous for stability to suit all kind of environment, and is probably not optimized. Thus, some codec may provides you better resolution or video rendering, and some may provide sweeter or louder sound and audio. Most importantly, if you have issue or problem with the default MPEG2 decoder, then the workaround is to change and switch to another MPEG2 decoder that has been installed. Vista Media Center MPEG2 Decoder Selection Tool is a small utility that allows users to easily change default MPEG-2 Video and Audio decoders in Windows Vista when playback DVD or MPEG2 encoded videos or movies contents in Windows Media Center (WMC). 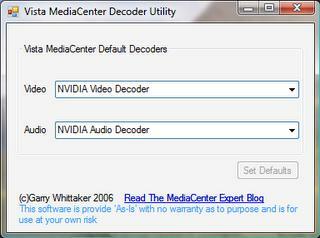 Vista MediaCenter Decoder Utility will show the current default video and audio decoders, and let users choose an alternative MPEG-2 audio and video codecs that MediaCenter will use from a list of installed decoders. To set the new decoders, press Set Default. Note that the WMC MPEG-2 Decoder Selection Utility does not work on 64-bit (x64) Windows Vista, partly because currently the only existing x64 MPEG2 decoder that installed and worked properly, is already provided and installed on Microsoft Vista x64 Premium and Ultimate installations. And it’s recommended to select video and audio decorder from the same provider. The utility actually modify the PreferredMPEG2AudioDecoder and PreferredMPEG2VideoDecoder registry values in HKEY_LOCAL_MACHINE\SOFTWARE\Microsoft\Windows\CurrentVersion\Media Center\Decoder registry keys. It also copies codec parameters which are wrongly installed in Windows XP location in HKEY_LOCAL_MACHINE\SOFTWARE\Microsoft\Windows\CurrentVersion\Media Center\Service\Video to the correct position.